Welcome to a taste sensation! 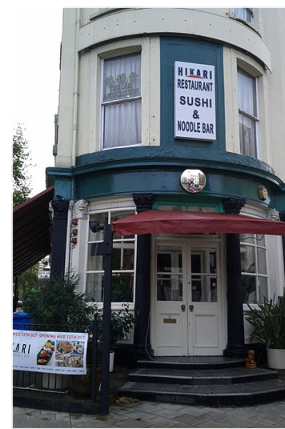 The Hikari sushi and noodle bar is located opposite Lambeth north tube station, and within 5 minutes of waterloo station. Serving deliciously fresh sushi and oriental food, hand crafted by our expert team who have worked in some of london's finest establishments. Owner Mr Chew studied for 8 years in Tokyo under 3 master chefs who taught him the essence of Japanese cuisine. Moving to london, Mr Chew worked for 9 years in The Japan Centre in Piccadilly as Head Chef, before opening his own establishment here in south London. Every day, our fresh fish is delivered from Billingsgate Market, and then expertly sliced into the finest sashimi and sushi. Our menu ranges from traditional delights such as salmon and sea bass to more eclectic delicacies including octopus, yellow tail tuna and ikura. Our in house team also is proud to produce original sushi designs that will not only amaze you with their looks, but of course their taste is spectacular too.